But how do you choose a property management company? We’ve got the answers to that, too. It’s a good idea to start with a list of local property management companies in your area. With that list in hand, you can start your research process online. Check out their reviews, and focus on companies that have lots of five star reviews. When people write rave reviews about the service they’ve received, you can hedge your bets on the company being on point. A few one star reviews shouldn’t freak you out, because some people have negative things to say about everything. As long as the overwhelming majority of reviews are really positive, put them on your “to call” list. Next up on your to-do list of picking a great property management company is to give two or three of the best reviewed companies a phone call. If you don’t hear back promptly, move on. If they can’t be bothered to serve you well before another company, why should you expect them to once they’ve locked you in? This is a great move to protect your interests. Once you being talking with a representative, there are three questions you should absolutely ask. There are some property management companies that cut corners in these areas, which makes these questions important to discuss. 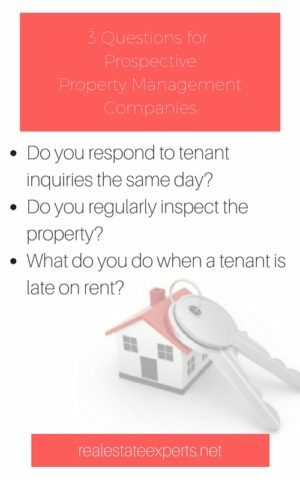 Do you respond to tenant inquiries the same day? 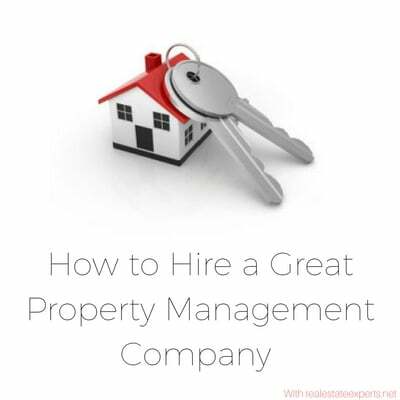 If the prospective company answers these questions affirmatively and confidently, you’ve got a great property management company on your hands. Finally, there’s one more question to ask. The fee you’ll be paying to the property management company is important to discuss. Not only because it’s important to know information up front and figure that into your budget, but it’s also important to know what the prospective company expects. Eight to ten percent of rent collected is a pretty standard fee for property managers. Most companies also charge a “lease-up” fee, frequently half or more of the first month’s rent, to cover all the upfront work of getting a tenant in place. At Real Estate Experts, you pay zero lease-up fee, which means we don’t get paid until you do. Once your property is leased, we charge at the bottom end of the spectrum, just 8% of the rent. And that’s our only fee, ever. Not only do we provide some of the cheapest rates, but I also feel confident telling you that we provide the best service you can get. In order to charge the least and give the most, we can only work with excellent clients. Learn what’s required to be a Real Estate Experts client.